Book Review: Revenge Wears Prada by Lauren Weisberger - Seriously, Where's the Revenge? don’t know whether I like it or not. The ending is kind of sweet but the whole story is weak; sorry to say that. The first time I read the first novel of Weisberger is a kind of funny story. I was still in high school and I know it is soooo long ago, about 10 years ago I guess. At that time I was wandering in the only one bookstore you could find in Pontianak, my plan was looking for some Sherlock Holmes but before that I stood around new novel section, a section you must visit when you are in a book store, and there it is The Devil Wears Prada (Indonesia version) is laying untouchable. Naturally, when you are interested in a book but you have no idea what is it about you will read the blurb. As a Harry Potter freak (I’m really a freak when it comes to Harry Potter, as freak as using the 7 books of Harry Potter for my Undergraduate Thesis discussing about Dark Humor significance from Fred and George Weasley characters), I found the blurb interesting. I have no idea whether the blurb in Indonesia version is the same or not with the original version but in Indonesia version, the blurb is talking about how crazy the job Andrea Sachs has in Runway, of course ‘crazy’ here is not defined as the job that ‘a million girls would die for’ but ‘crazy’ in literal meaning and one of her ‘crazy’ job list is getting the unpublished Harry Potter’s book for Miranda Priestly’s twin daughters. So, without a doubt I bought the book. And some years after that (2006), when I was already in college and moved to Jogja, the movie with the same title released with Meryl Streep as Miranda Priestly and Anna Hathaway as Andrea Sachs and it seems like everyone talked about it, and I just like “Well, I’ve read the book” though I remember that I didn’t really enjoy reading the book. The story is fresh and Miranda is really evil and who doesn’t like glamorous job, and Andrea Sachs access to all branded and beautiful fashion outfits and accessories is totally like a dream job for every girl; it so obvious the job is a kind of job that a thousand girl will die for but honestly, reading the book is kinda boring. 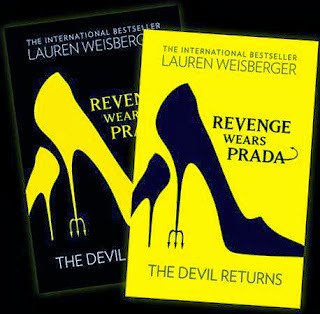 I thought perhaps because I read the Indonesian version, and sometimes you could just blame the translator why the book is not as interested as the original version, but since I never read the original English version of The Devil Wears Prada so I cannot comment much. However, since people talk about it a lot; it was kinda cool if you admit that you have read the novel before you watch the movie. And 10 years later, just like in the book, I read Revenge Wears Prada, the original English version this time and I still don’t know whether I like it or not. I’ve been starting reading the book last Sunday and I need 5 days to finish it. Well, it is quite unusual for me because normally I read novel in maximum 2 days even in my busiest day. But heck, since I have bought the book then lets reading it anyway. The first impression I got from reading the early chapters of the book is “Where is Alex? And who the hell is this Max guy?” though and then I learn that Max is actually a sweet, handsome and rich guy type and I start to like him, because he seems really love Andy aside from his mother’s bad taste of appropriate wife for her precious son. Thought it is cliché but having a handsome, rich and sweet boyfriend is every girl’s dream; that is why I decided to learn liking Max. And then the story begins when Andy got married and gave birth to Clementine and The Devil Wears Prada a.k.a Miranda Priestly is back with Big Revenge in her head. Well, at least that what I thought when for the first time Elias-Clark is contacting them in the middle of Andy and Emily’s successful magazine, The Plunge. Though and then I am a bit disappointed that Miranda’s role is less than what I expected because the title of the book is Revenge Wears Prada, but serioulsy where's the revenge? When the first time I read the title and the short blurb, somehow Miranda is really trying really hard to make Andy and Emily life miserable. Well, in the end I just got impression that it is purely business that Miranda concerns. As an editor in chief of the biggest publisher company in New York and aside from her evil nature, Miranda is purely a business woman, the smartest and the trickiest one though. And how The Plunge finally in her palm is because she is an experienced business woman and Emily is not and while Andy is too paranoid. Yes, I think Andy is paranoid, well she always is paranoid, even after ten years the ‘f’ word is said and she was fired in spot by Miranda. And somehow there is a big lack of this book; Andy’s paranoia and Emily’s obsession to prove herself to Miranda and the fact that Miranda doesn’t give a damn with the ‘f’ word Andy said or Emily’s obsession, makes me think like there is something missing in the story plot. Although then , I cannot blame Emily of being too obsessed, her hard work with Andy is finally got appraisal from the devil herself, unlike the old days, this time The Plunge becomes Miranda’s obsession, and everyone will feel like flying to the nine clouds in this kind of situation. Not to mention, Miranda is naturally born as a charmer, and Emily is easily charmed by her because her dream is always working for Miranda, she is the only one who could stand with however crazy and impossible Miranda’s demands are and I think she is the best assistant Miranda ever had, that’s why the fact that she was fired by Miranda without any significant reason is totally unfair for her and makes her obsession to prove herself to her becomes out of control. That is why when finally Elias-Clarke contacted them to buy The Plunge, Emily thought that it is the time for her to prove herself to Miranda. However, what Emily doesn’t count is that her obsession with Miranda has blinded her, that Miranda is the same person, as evil as always, or perhaps more evil than she used to know. She thought that she would always be able to handle Miranda like the old days and forget the fact that to do that she needs Andy. It is supposed to be the big role for Andy to assist Emily and drag her to reality. But once again, Andy is too mess with herself to think about assisting Emily. Andy’s reason not to sell the magazine is because of her trauma of working with Miranda and although she knows exactly what will happen with her magazine if Miranda has control on it, she didn’t do anything but keep postponing it until it is too late. If Andy has a bit courage to stand before Miranda, she could be as powerful as Miranda herself. Well, at least it is a kind of character I expected from Andrea Sachs. There is a moment I like from the novel, when her training during in Runway saves Emily’s life during their holiday and could arrange a helicopter and doctor easily. I wish that finally Andy could find how brilliant she is and it happens because she once work for Runway; I thought Runway trained her too well until she could defeat the devil herself. But I think it is something a reader too much to ask. Okay, let’s move the topic of “Married Andy”. I’m not married so honestly I don’t know what is exactly happening in Andy head when she decided to get divorce. But even as a single woman I couldn’t get the big picture of how could she left her husband who loves her and obviously she loves too and let her daughter grows up with divorced parents just after the betrayal of her husband who sold the magazine to Elias-Clark. Once again, let’s talk about business, as a businessman, the only thing Max could see is surely the interest he would get if Elias-Clark buy The Plunge; that is why he invested his money to The Plunge in the first place, besides that his biggest goal is for the sake of the name of his family, Harrison clan, and of course his daughter. Though of course, the problem is, Max never understands the trauma Andy had by working with Miranda Priestly 10 years ago, because Max didn’t work for Miranda, he doesn’t know how evil Miranda could be. But they are married couple, they should figure it out how to understand each other. It’s not like Max betrayed Andy for another woman and sell his business roughly. The offer is clear and totally profitable and they could sell the magazine legally no matter Andy has agreed or not because of the combined shares of Max and Emily have. Well, perhaps it is a big warning to not ever combine personal life and business because if Max is not her husband and Emily is not her friend, Andy has no right to complain if the magazine is sold to the third party. Lets’ get a flash back a bit to the first book, when Alex finally decided to leave Andy because at that time the humble and simple Alex who is only teaching elementary school through Teach for America couldn’t understand Andy’s obsession of being a successful woman and sell her soul to a devil called Miranda Priestly. Well, at that time, Andy chose her job over her boyfriend and friends. Shouldn’t she learn from her past and think of the sake of her family this time? She lost Alex because of her job. And now she is totally in Alex’s position, chose to leave her husband because she thought that her husband thinks more about business than their relationship. She should be the one who know pretty well what happened to Max after she left him, because Max is in her position 10 years ago when Alex dumped her. Fine then, the magazine probably already sold and all the nightmares Andy had foreseen is actually happened. Miranda is as evil as always, she fired all people who have been working hard with Andy and Emily for The Plunge all this time just because they are not in Runway’s style and class. Is “I told you so” not enough for her to tell her husband and Emily? God, Max is her husband and Emily is her friend, Emily also shares the same hell with Andy because of Miranda. Can she just forgive them? It is true that I always like the humble and simple Alex, the elementary teacher of Teach for America, and their reunite in the end of the book is kinda sweet because both of them seem could not get over of each other. Still, why don’t Alex stay as humble as he used to be and not some kind of School Principal of the third most expensive school in the world? Well, once again, I guess as a reader it is too much too ask, isn’t it?